Do you use hashtags in your social media marketing? What if someone else is using the same hashtag about a totally different topic? Even worse, what if your competitor is using the same hashtag about the same topic? Before you just throw any word or phrase out there and decide to use it as your hashtag, there are a few things you’ll want to consider to maximize your hashtag’s exposure. Since the first person used a hashtag in August 2007, they have become one of the most commonly used symbols on Twitter. People use them to organize conversations, tweet at events and engage in conversations online. But in order to have a successful marketing campaign using a hashtag, you have to know how to pick the right hashtag. Here are 4 tips for choosing a successful hashtag. However, if you want others to join in on the conversation and be able to engage with each other, you have to use a hashtag that is more unique—not something as simple as #marketing or #webinar. Verizon Wireless is a great example of a company that knows how to pick hashtags that will make them stand out in their industry and are also recognizable. If you search for just #verizon, there are thousands of tweets that appear. Knowing that, Verizon makes sure they pick a more detailed hashtag for their different webinars and chats, such as #VerizonNOLA10 and #VZWINNOVATE. 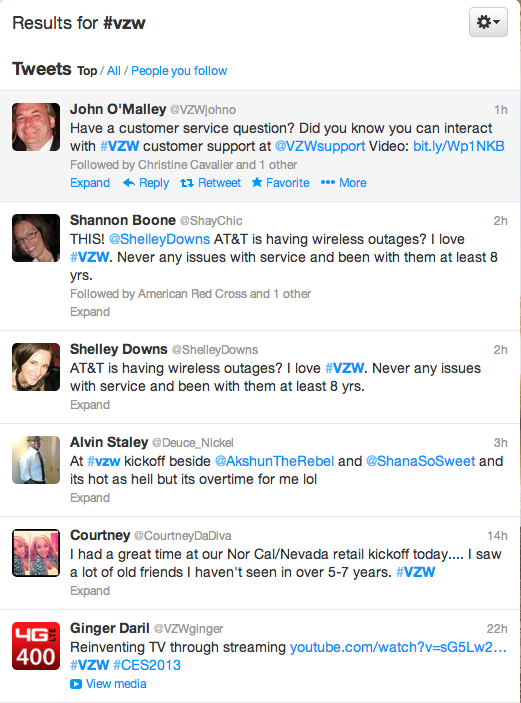 When you take a look at the results on Twitter for #VZW, you see a very crowded tweet stream. Many people use #VZW when talking about Verizon, so anything they are saying about the company from getting in touch to customer service to commenting on their phone will be picked up in this stream. 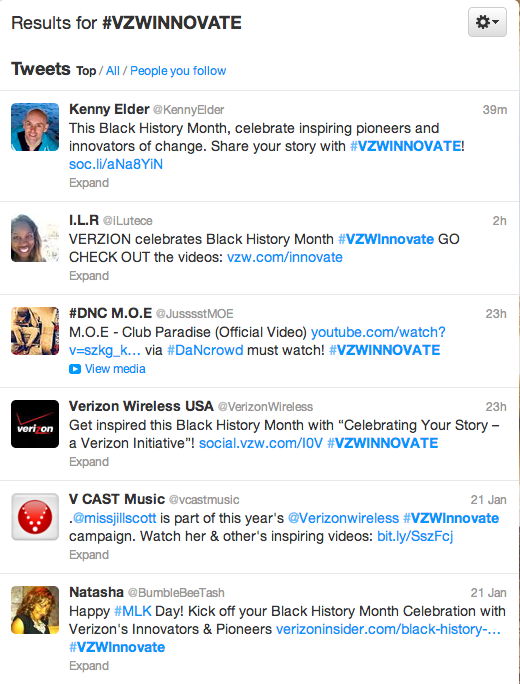 In the picture below, you see the tweet stream for #VZWINNOVATE, which exclusively focuses on Verizon’s participation in Black History Month. By adding the “INNOVATE” to the end of “VZW,” you’re able to understand that the hashtag has to do with Verizon, but also involves a campaign they’re doing. It’s clear and unique and is not being used by other companies, which is important when differentiating yourself and your social media strategy. When choosing your hashtag, make sure it is something unique and specific so that it doesn’t get mixed up in other conversations going on. If you use general terms such as #marketing or #webinars, these updates will appear in the results for everyone using these terms. This can be good, but it also won’t allow your participants to carry on a conversation about one topic. When choosing a hashtag, it’s important to make sure that your hashtag is easy for users to remember. With thousands of hashtags roaming the social media universe, the last thing a business wants to do is create a hashtag that is hard to spell or pronounce. Users will end up spelling it wrong and this defeats the purpose of having a hashtag in the first place. Hashtags should be short, easy to pronounce and spell and give users a better idea about the topic of the conversation or tweet stream. National television network ABC has a lot of programming, and each show has its own hashtag, allowing people to tweet about the episodes and the actors and actresses. But ABC is smart and strategic with their use of hashtags. They make sure the hashtags are visible on the website and occasionally have them appear in the bottom corner of the episodes that are playing. In the case of the show Dancing With the Stars, thousands of people tweet about the different dancers, in addition to the show itself. 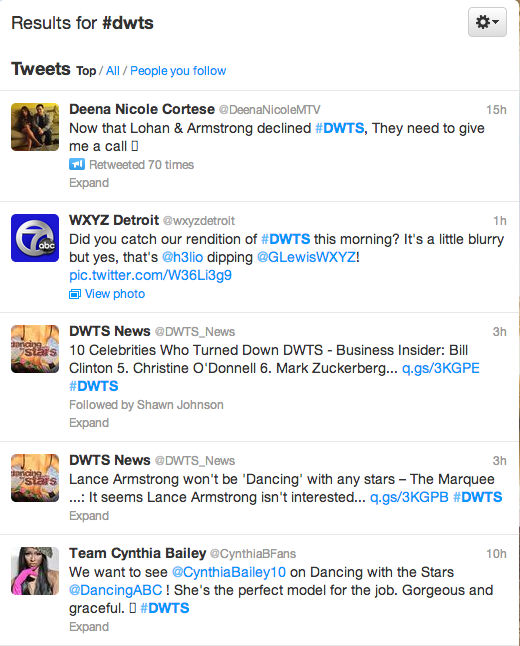 To bring it all together, ABC promotes the hashtag #DWTS. It’s simple and easy to remember and will also not take up a lot of space in tweets’ 140-character limit. #DWTS is able to organize everything people are sayingabout their show and engage with their audience, thanks to this hashtag. And fans who are watching the show don’t forget it because it’s so simple. When choosing your hashtag, consider your objectives for having people come together for the conversation, and also make sure it is easy to remember and understand. If you have a hashtag that’s too complicated, long or hard to spell, it will defeat the purpose of a hashtag, because people may forget it or may not be able to fit it in their tweets. As you work toward making your hashtag second nature for many users, try to adopt it on multiple channels. Although the use of hashtags may have started on Twitter, they are now used across multiple social media channels including Facebook, Google+, LinkedIn and Pinterest.Hashtags allow users to organize their content and pictures while also instilling the hashtag into the minds of their audience. Take Southwest Airlines, for instance. 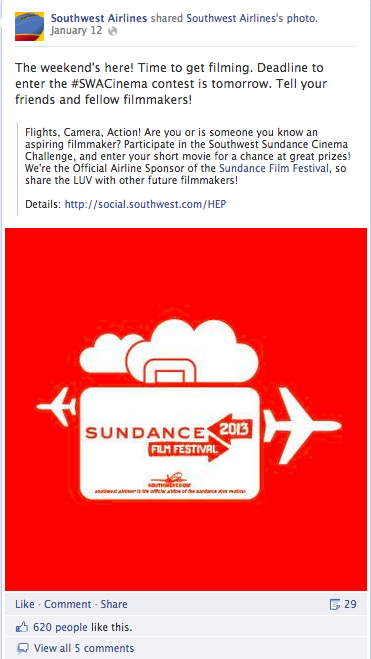 They held a social media contest for filmmakers to submit their videos for a chance to win prizes. They started off by just using the hashtag on Twitter, but soon adopted it into their other social media channels including Facebook. 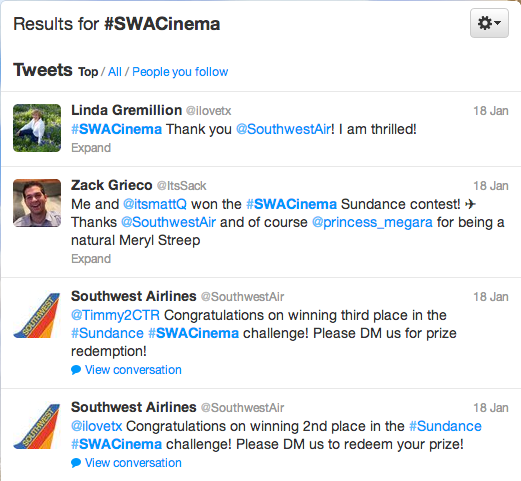 Southwest Airlines using #SWACinema on Facebook. If people see a hashtag once, it may stick in their minds if it is truly memorable. But most likely it takes a couple times of seeing the hashtag to really remember it. Use the hashtag on multiple social media channels. This helps you in two ways. First, this gives your hashtag more exposure to more people to help spread the word about it. Second, this helps people to remember your hashtag when they see it multiple times on different channels. Embarrassing situations can occur if you don’t do your research first. What if the hashtag you’re using has already been used in a discussion about something negative? What if the hashtag is associated with a natural disaster in another country, but you didn’t realize until after you sent your tweet? Before using a hashtag, you always need to search to see if other people are using it and what they are saying. Entenmann’s learned this the hard way when they used the hashtag #notguilty to talk about their cookies when other people were using it to talk about Casey Anthony’s#notguilty murder trial verdict. They apologized and admitted afterwards that they had not researched what people were saying on the hashtag ahead of time and therefore did not mean to tweet something so insensitive. Take what Entenmann’s learned as a lesson. Always check what people are saying on particular hashtags before you tweet anything. If you want your tweet to stand out, tweeting on a negative hashtag is not the way to do it. When you use hashtags in your social media strategy, the key is to make sure you’re using the right hashtags at the right time to ensure you are reaching your audience in a positive way. By following these 4 steps, you’ll be able to choose a hashtag that’s memorable and unique. But the most important step of all is to see what other people are saying on that hashtag or topic in advance. Remember that it’s okay to use general hashtags such as #marketing or #webinars, but it’s harder to make those effective when trying to have a unique conversation. Use multiple hashtags if the topic is right, but do not add extra hashtags in an attempt to show up in as may searches as possible.